The Edge is equipped with an ISOBUS system for easy "plug and play" for standardized connections, cables and software for use with any compatible controller. The system was built using precision manufacturing with laser cutting tech and slot and tab design, which gives the Edge self-centering components such as the spinner frame, material divider and hillside divider. Precise boundary spreading is a key feature of the NL4500 G4 Edge from Highway Equipment Co.
An upgraded hydraulics system has been developed to support independent spinner speed control for boundary spreading, fast and exact conveyor control and an automatic chain tensioner and the Edge comes standard with automatic lubrication alerts. The NL5000 G5 makes it reality, making it easy for operators to not only target the right product to the right place, but also respect the environment without sacrificing productivity. How? A patent-pending spinner design delivers revolutionary left to right and right to left swath width control for never-before-seen spreading precision, which maintains a precision drop point for repeatable product placement. 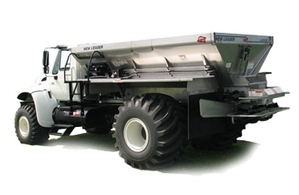 The G5 gives operators the ability to shift the fan frame fore and aft as well as left and right to control the swath. This alters where the product falls onto the spinners while moving through the field. This technology along with adjusting the conveyor speed gives pinpoint accuracy capabilities. Spread materials fast, wide, and with increased accuracy and consistency, with patented G5 spinner technology. Next-level technology gives operators right to left and left to right swath width control for more accuracy in placing nutrients. But the real difference comes from the unprecedented spinner and spinner assembly control in the G5 design, delivering unmatched precision product placement. 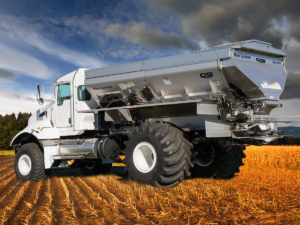 Experience fast and exact conveyor control, independent spinner speed control and extended conveyor life with the superior New Leader hydraulics system. High-tech sensors give operators early insights into potential issues by monitoring hydraulic condition and performance based on metrics including fluid level, temperature, filter restrictions and conveyor and system pressure. Multiple test ports make in-field service and diagnostics easier. A new anti-cavitation system reduces the vibration and metal erosion that causes hydraulic system failure, and helps quiet the spinners during shutdown. 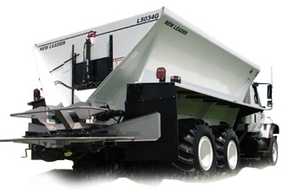 The NL5000 G5 maintains proper chain adjustments with an automatic chain tensioner. Continuous tension helps extend life. In addition, operators receive automatic lubrication alerts after 10 hours of conveyor run time. 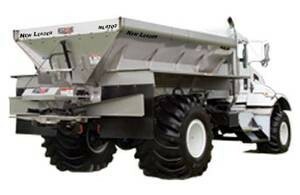 Built with the operator in mind, the NL5000 G5 simplifies maintenance to maximize time in the field. 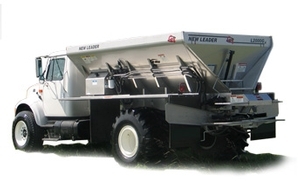 A flip-up hillside divider lets operators move easily between spreading lime and other products, while maintaining max flow – and without getting out a single tool. Precision manufacturing for fewer adjustments, Corrosion-resistant 304 stainless steel cross tubes, mounts, spinner & feed jack handles and take-up brackets, Front and rear grease banks for efficient greasing, and Automatic chain tensioner to extend conveyor life. No need to operate multiple displays—the user-friendly New Leader interface makes it easy to get to work without a learning curve. The intuitive, easy-to-use New Leader user interface appears once the system is connected to a virtual terminal. It also incorporates the power of diagnostic feedback, stored profiles, automated service notifications, low bin countdown, automatic chain oiler and more. Can I apply more than one product with the G5? 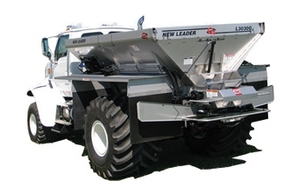 Increase efficiencies and productivity by adding a 5 ft. or 7 ft. MultApplier insert to the NL5000. Adding a MultApplier lets operators spread one or two products simultaneously or at variable rates in one pass. Featuring increased gate openings, the NL5000 G5 with MultApplier can reach higher rates, application speeds and widths. 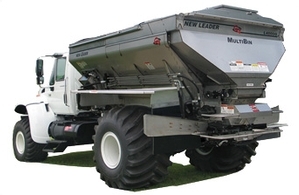 For the addition of micronutrients, the MultiBin is also available, for spreading up to four products in one pass. Additionally, the improved waterfall divider and matched-rate output of the MultiBin is now standard on the NL5000 G5 and supports even higher rates of output. That means more flexibility for a wider variety of micronutrient applications.